This past weekend, I was able to do something I have not done since April … attend a tournament! Unlike most of my brethren from the Outlanders, I am unable to participate in the closest GT since I am the primary organizer of it, and between that and finishing my Master’s degree this past summer I was able to play very little Warhammer. Thankfully, this fall I had more free time, and I got to get in 5 games with the Empire. At the Bugeater, a great guy named Hayne told me that his group was putting on a tournament called Rock Wars GT at the end of September. It had 20 some people attend last year, but he was really hoping to boost it up to a comparable size compared to our fantasy field in 2012. The GT was the weekend before debate season started, so I knew I’d be able to go. I couldn’t miss a day of teaching (I only get one personal day a year), so as a grad present to myself I flew out to Little Rock. The Outlanders traveled in force, however, as fellow Warhammer nuts Dan Gor, Adam, Travis, and Billy drove down on Friday. The tournament was a 2 day, 5 round event. 2500 points, with no hard comp. Instead, there’s a 50 point soft comp score that you know about well ahead of time. There are army specific penalties (so for Empire you get -5 points for having more than one Helblaster, for example), or in the case of Wood Elves a +5 point handicap for bringing the hippies. Battle points are 15-5 for a win, 13-7 for a minor win, and 10-10 for a draw. There are 5 bonus battle points up for grabs each game. It is entirely possible for both players to grab the 5 bonus points, and happened often. You always used VPs to determine the winner, but like the Bugeater there were five secret missions (you can only use each one time) that give you a bonus 300 VPs if you complete it. Painting was on a 50 point scale. 45 points was the cap, and if you were one of the top 5 painted armies you got additional points up to the 50 max. Sports was also on a 50 (45 cap) scale. 45 was the max, and you got +1 point per best game vote that you received. The mission scenarios rotated through the book deployments, but would forego the weird aspects of the book mission (no auto-lose for losing standards, for example). There were other elements to the scenarios: in game 2 you had a “raspberry” that you could give a character, and he could throw it at an enemy within 12″ to stop them from moving for a turn. In game 3 you could call the Hogs of War, and they’d move in 4d6″ direction, and any units they passed through would suffer 2d6 hits with the strength equal to the turn number. They were definitely game changing, but if you were smart about it it wasn’t unfair or broken. For the summer campaign at our store I had been running a Popemobile, a lvl 4 / lvl 2, 2 40 man halberd blocks, a 20 man spear detachment, 2 4 man demigryph units, a stank, a hurricanum, and two cannons. I made a couple of tweaks, partially because I didn’t feel like painting 20 spears, and partially because I felt it was a more viable option. I dropped the spears and the level 4 to give myself a 10 man inner circle knight unit with full command and the flaming banner. I only got to test this version of the list once against Adam. Although I lost the game, the knights did really well and took on a crypt horror by itself and finished it off. I was confident that this gave me another unit that could either do damage or absorb some blows thanks to the 1+ armor save. I went with a lvl 2 fire wizard because fireball is always good, and flaming sword is awesome if I happen to get it. Game 1 versus Daemons. This was a pitched battle deployment with five objectives near the midline of the table. Units can capture an objective, roll a d6 and get some sort of buff – e.g. +1 attack, 6+ regen, etc. You got a bonus battle point if you captured one of the objectives at any point in the game. So you didn’t have to hold all five at the end, just captured once. His list was a Keeper, lvl 2 with spirit swallower, a 10 man horror bunker with a life herald, a big blob of bloodletters with HoK, some hounds, a souldgrinder (without the flamecannon, surprisingly), and some fiends and screamers for support. I deployed the heart of my army on the right flank, and hoped to swing the door shut on the left with demigryphs and IC knights. The deployment is in the pic to the left. I won first turn and sent the fast units on the left screaming towards the objectives. I generated 4 steam points, because if I went for 5, misfired, and rolled a 3 on the misfire chart it would kill the steam tank. Good call, because I misfired, rolled a 3 and only got the ‘7’ result instead. The demigryphs captured one token, my halberds got another. I got three cannon shots off (1 from the stank) and killed the soulgrinder. He moved up and we had a scrum in the middle with his chaff versus my cavalry. He moved his keeper up behind the building on the right. That would have been a good spot, but it gave me a clear shot from my cannon on the far left. He failed his ward and I got extremely lucky and rolled up 6 wounds. Since he had spirit swallower, I had to knock him out of the fight now or he’d regain those wounds easily. His army would have its revenge, however, when a bog standard bloodletter KB’d my BSB the next turn. My one halberd unit fled, while the other worked around the building to address the bloodletters. The first halberd unit rallied, giving me one turn to set up a combo charge of halberd unit #2 on the flank, and the arch lector and hurricanum in the front. In the intermediate turn I got off a banishment that took off 9 bloodletters. I charged in, and the impact hits plus horde halberds did their damage. He would get one last revenge when a regular ol’ bloodletter KB’d my archlector. His tzeentch bunker would survive my attempts to reach him with my cav, but I killed off everything else. My opponent was pretty unhappy about the “lack of terrain” on the board, but a) his keeper died to a really lucky shot and b) he should have known the position he put it in gave me a clean shot with my cannon. I got 15 for the win, +5 for capturing all objectives, and he got 5 for the loss and +4 for getting four captures at one point in the game. Game 2 was against Ogres. He had a 11 man irongut unit that he ran three wide, with two characters in the front rank with a 4+ to soak up wounds. He had a bull unit, two cannons, two leadbelchers units, a 40 man gnoblar squad and some more gnoblar chaff. The scenario was the “raspberry.” Blood and Glory deployment, but none of the other rules. The raspberry can be thrown at the start of the turn at a target within 12″. They can’t move, have -1 penalties to hit for a turn. It best serves as a charge blocker, and that’s how I used it in this game. I hoped the building would give me some protection from his shooting for my more vulnerable units. This picture was taken bottom of turn 1 as he was starting his movement phase. The demigryphs on the right are so far behind because they had to to make a 90 degree turn to get that far over on the board. I deployed pretty much in the center, and so did he. I pushed slightly to the right. My goal was to send one demigryph unit down the right and one with cav and stank down the left to eliminate chaff and give supporting flank charges for the halberds. Because I couldn’t deploy 9″ from the side board edge, I had to start my right demigryph unit perpendicular to the midline and have it wheel out on the first turn. In the game all of our cannons enjoyed rolling 1s to wound, although I got the better end of the deal by taking out one of his cannons before a demigryph unit eventually got another. The key thing that made the game a lot easier was that in turn 3 his lvl 4 (and general) miscast and sucked himself into the warp, doing plenty of strength 10 wounds to his ironguts in the process. He made it a pretty close game with some insane rolling. I charged one of my halberd blocks in to his irongut block. My unit had the hurricanum, hatred, and re roll wounds. Because he had two characters, however, I could only throw three ranks at the unit. I killed a couple of ironguts. For the characters, all but two attacks wounded (I think 17?). When he was done rolling his 4++, there was a wound left on his BSB and 2 wounds left on his other hero. FIVE wounds got through. He stomped face, and had steadfast because he was deep and I ran. My other halberd unit turned around, he reformed to face them, but his luck was not going to last. I wiped out his unit, while my demigryphs and knights mopped up his leadbelchers and surviving cannon. In the end, I tabled him except for a 25 point gnoblar unit in my deployment zone (his secret mission for 300 vps was to have a unit above 25% starting wounds in my deployment zone … that was my secret mission as well). I won by a wide margin, took 15 BPs to his 5, and got bonus battle points for using the raspberry (top stop his ironguts from charging so I could charge him and not take his impact hits) and killing his least expensive unit (the other 25 point gnoblar unit). Game 3 I’m playing Lizardmen. Standard pitched battle, the scenario special rules didn’t really affect us too much. I made some critical mistakes in deployment that cost me the game. I posted up my halberds on the far left right away, whereas he put his chaff where he wanted and waited to drop his two big saurus units until the very end. His list had a 50 man saurus block, a 50 man temple guard block with light slann with becalming and the thing that stores dice, two salamanders, two chameleon skin units, and a ton of skinks. I lost (drew) this game in deployment because my support units, critical in breaking a tough saurus unit, couldn’t reach them thanks to all the skinks. Poor deployment cost me the win. This would be compounded by poor decisions that I made in the first two turns. I went for charges against his skinks with my cav, only to have him flee and I failed to redirect producing two turns of failed charges. If I had played it smart, and just marched up there on turn 1 so I had 6″ charges, I would have decimated his skink blocks and gotten into his saurus. He really had no answer for my demigryphs, but my lack of playtime with the new empire army book was showing in my decision making. He lined his Saurus up across from my halberds. My cannons didn’t have much to target, I blew some saurus up trying to get some failed look out, sir’s on his saurus oldblood. One cannon did wipe out a salamander which was nice. The other salamander killed 10 halberds on turn 1, so I promptly sent my knights in to kill it. After, he was able to get a charge off with his templeguard, but only killed five knights and he didn’t pursue so he coudl avoid the flank charge from my halberd horde (he was only 5 models wide and many ranks deep, so it would have been a juicy target). By turn 4 I was able to start hitting him. Against his regular saurus block I deployed five wide and eight deep to pin that unit in, while my other horde faced his temple guard head on. I took him down to two ranks, but he killed more and I fled. He managed to catch the hablerds and kill the hurricanum. What kept me in the game despite my inept deployment and first two turns was that his slann miscasted on the first three turns, taking him down to a level 0. His skink priest was also a level 0 by turn 4. In the end, we drew. I killed all of his chaff, but he got my bsb, one of my hordes, and the hurricanum. What made it a draw was that I completed my secret mission, and he didn’t. I issued a challenge with my AL to his champion, and he declined. For my secret mission I had to kill someone in a challenge or I auto-complete it if they decline the challenge. The talk of the evening was wood elves. A player with a nasty wood elf army was in first place, and we were all talking about how it was doing so well, why no one had stopped it yet, and what tricks the guy was using to really break the meta. It was a lot of fun. 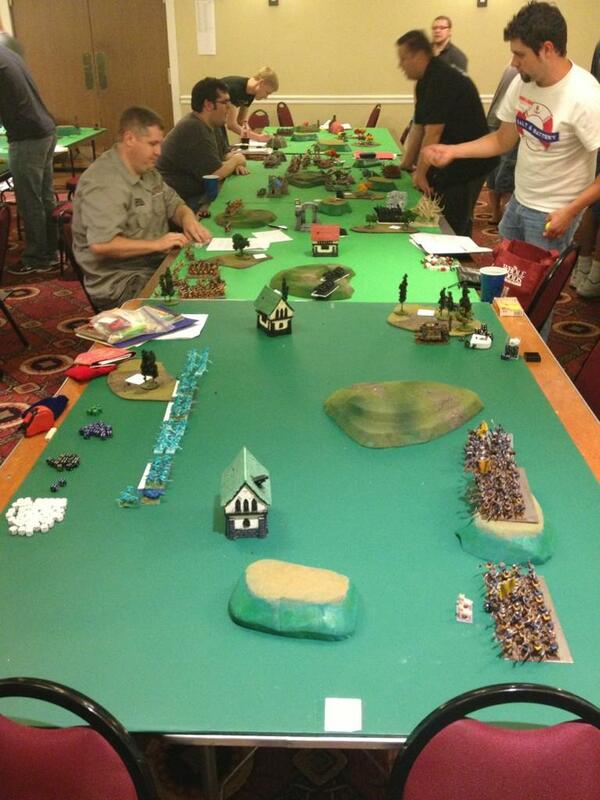 I was on table 4 on day 2 against Ogre Kingdoms. Sorry to say, I don’t have a picture of this one. It was the diagonal deployment, and I was up against a stonehorn, a cannon, a block of maneaters with a lvl 2 firebelly, an ironguts unit with a lvl 4 caster, and a ogre unit with a BSB … oh and mournfang. I again made some mistakes in deployment and was too aggressive with my knight placement (they got charged by maneaters and demolished), and I placed my demigryphs too early in my drops, he was able to line up his mournfang right across from them and get a charge off turn 1. Now normally, those mistakes are recoverable, but when the dice don’t go your way that won’t happen. He got first turn, charged in his mournfang. My demigryphs have higher initiative, and I did six wounds. With his armor at only a 5+, even with the dragnohide banner, I figured I should kill one mournfang. He failed all of his armor saves, but no ones … but then rolled six parry saves. So I took on the full brunt of four mournfang, lost a demigryph + another wound, and promptly ran off the board. On turn 2, his maneaters charged my knights (again, terrible positioning). He did five wounds, I failed 4 3+ saves. I knew some knights would die, but I hoped it would be 2 or 3 for a decent leadership check (I had done 2 wounds back). They promptly fled. I got my steam tank into combat with his regular ogres, but not before taking 5 wounds from his cannon. Even that was recoverable, however. My halberd hordes would shred ogres because they’re going first and all my buffs are still intact. My halberd horde charged his mournfang when they returned to the board, killed all but one, which promptly ran. Losing the demigryphs on that side of the board meant that I had nothing to chase down that lone mournfang, so he managed to keep all 300+ points intact. The biggest thing came when I killed his stonehorn. His ironguts failed a panic check (despite BSB reroll), and fled away from the combat through a building. Now there was a bottleneck, and his ogres blocked the one direct way to get to his ironguts. I got him down to a single ogre and his BSB, but the combat didn’t start until the bottom of 4 and I just ran out of time. My other halberd block wasn’t fast enough to go around the building to get to the ironguts and my other surviving demigryph were also caught out of position. In the end, I took a big loss because he got my stank, knights, demigryph, and both cannons. I only killed his cannon and stonehorn. I was one wound away from pushing to a draw though – the lone bull left had just one wound left on the bottom of six. Game 5 I played dwarfs. The scenario had standard deployment, but it had an exhaustion special rule. You could choose to check for exhaustion for each unit. You roll’d a d6, and if it was a 1 that unit couldn’t march, -1 to hit, could only fire on a 4+ (if it was a warmachine), only charged d6 instead of 2d6, and if it was random movement moved at one less d6. After the round four loss I needed close to 20 BPs to get back in the running, so I committed to testing every round. In hindsight, I shouldn’t have tested turn 1. His army was 2 units of 40 warriors w/ great weapons, one block of hammerers with a thane BSB and runelord, 2 cannons, an organ gun, and a stone thrower with all the runes to make sure that if they didn’t do their job the first time, they will with rerolls and who knows what. He deployed in a corner and I layed out on the 12″ line with the goal of closing in as fast as possible. On turn 1 both my steam tank and a demigryph unit were ‘exhausted,’ which was rather debilitating to getting there quickly. He got first turn (crucial), and he blew up one cannon, and his stone thrower killed 10 of my halberds. I continued to move up, and I made the mistake of moving my AL out of cover too soon. On my side of the table there was a special type of wood completely blocked LOS. I hid my hurricanum and AL behind it. I should’ve realized how squishy they were and kept them there, especially since the arch lector has a leadership bubble of 18″. I moved them out turn 2 to get them up with the halberds. My steam tank misfired on its cannon shot, and my other cannon hit a warmachine, but only did 3 wounds. Since he bought an extra crewman, his cannon survived. I’m trying to get forward quickly, but the casualties are mounting. On his turn 3, he killed my hurricanum in one shot (rolled up 5 wounds), and sniped my AL out of his war altar. I should have realized how accurate dwarf weapons are with all their runes, which meant that he WOULD hit my war altar, and I’d therefore have only a 50% chance of avoiding cannon death with my 4+ ward. My demigryphs failed their panic check and fled, again crucial in preventing me from getting to his lines quickly. At this point his infantry surged forward. I got into combat with him and killed 15 warriors from his far right unit (see picture), but he had 20+ attacks back at ws4 and s5, and so I ran and he managed to chase me down. My knights charged in next against his warriors, while my other halberd unit dealt with his hammerers. My steam tank crashed into the left warrior unit, taking off a full rank, but since it took a cannon shot on the way in (lowering it to 6 wounds), I couldn’t reliably generate points to grind him out. Laughably, the 2d6 s2 hit misfire result was killing more dwarfs than when I actually got to grind or use the breathweapon! In the end, it was a clear victory to him. My demigryph unit on the far right that didn’t panic managed to smash into his far right warmachine half way through the game, and started domino’ing down his lines. At point I failed to overrun by 1/2″, which cost me a playerturn. If I had managed that overrun, I could have been in his left warrior unit’s flank and saved my steam tank by turn 6. My other halberd unit survived, but both his warrior units were at half strength and his hammerers still had 10 models left. He got both my cannons, my hurricanum, my AL (he killed the war alter in combat), a halberd horde, my BSB, and my steam tank. I only got the VPs for his war machines (although those things are pricey at nearly 700 points). The theme for my two losses and draws were bad deployments and not managing my first two turns well. I had good plans to recover later in the game, but that recovery was conditioned on the dice going well or at least average. This is a game where the dice WILL go against you at some point, so having to play catch up was doomed to fail. The nice thing is that, while flying home, I was able to really think about what I could do differently. I thought about dropping the war alter and putting the AL in a unit for warmachine protection, or dropping the knights and picking up a helblaster, but I think for now I’m going to keep playing with a relatively similar list. The fact that it was deployment mistakes that really handicapped me tells me that I need to get more games in, I don’t need to go back to the drawing board for the Empire. Overall I finished 16th. Considering my nosedive on day 2, that’s pretty impressive. I scored perfect sports, and got one favorite game vote. I got 40 / 45 for painting (you can only get 45+ if you’re in contention for best painted). There were a couple of points I felt I missed – I only got points for basic conversions, I probably should’ve gotten one more point since the next category up indicates significant conversion work on characters. My BSB is converted, but the War Alter and Hurricanum are almost 100% converted. I’m going to make a custom AL instead of the stock warrior priest I have right now to hopefully make that stand out even more. One point I would’ve liked, but didn’t earn, was for army standards. I just didn’t have time to finish these. I have one standard done – on one of my halberd units – it has an anchor emblem in a blue square on yellow flag. It also has a blue rectangle 45 degrees down from the blue field, modeled after flags in the English Civil War. But that’s my only done standard, I need to finish the rest. As far as our group, Travis got 5th best overall with Orcs and Goblins, with his only defeat coming to fellow Outlander (and roommate) Adam – who went undefeated and took Best General. Wood Elves took Best Overall … I REALLY wish I could’ve played him. Terrain: Good. Standard fantasy terrain, although I liked that the hills were high enough to actually block LOS. Cool touch having the forest predetermined (you flipped a card over when you encountered it to see what it was). The boards were actually cardboard with this green material taped over it – looked cool but the green material would tear really easy. No complaints here. Prize Support: …. good? I don’t know how much the winners got in their gift certificates, so I can’t fully commit here. BUT what I saw was good. People got nice awards if they placed, they had raffled prizes ranging from bags of dice up to full KR cases. Turnout: Average*. The asterisk will be explained in a moment. As a single event “GT,” less than fifty players isn’t a huge field. BUT they only had 20 some last year, so they doubled in size. Their target is 64, which is also the target of the Bugeater this year. I only say average because when you compare it to other fantasy-only tournaments (ala the North Star), it’s a little small. They had a decently diverse field though (guys as far as Illinois, and us obviously), so the quality was high. Format/Scheduling: Good/Great. Ending at four on Sunday is good for out of towners like me. I could’ve done 4 on Saturday, but that would’ve lost us the after party. The lunch breaks were nice … a little too long on one day and we all just started the round a 1/2 hour early. Other than that, there were no major delays, pairings were posted with plenty of time, and the schedule was not burdensome. I liked how he did comp – there was no subjective judging the day of. Even if you disagreed with some of the penalties, you knew about it months in advance and could choose to take the penalty or tweak your list. Scenarios: Good / Great. I feared that the scenarios would overpower the game, but Hayne was nice enough to put out three of the missions well in advance so we’d know what to expect. And while the outcomes of some of the games certainly did hinge on some of the scenario elements, you knew about what they were well in advance. I liked that he just varied the deployment types based on the book missions and didn’t do the stupid reserve stuff or anything else. Conclusion: Great! More the sum of its parts I guess, although most categories I put good – even though I had a terrible day 2 gaming wise I still had a great time. Hayne did a ton of little things to make you feel welcome and have a good time. He personally picked me up/dropped me off from the airport. I’d recommend it highly next year. 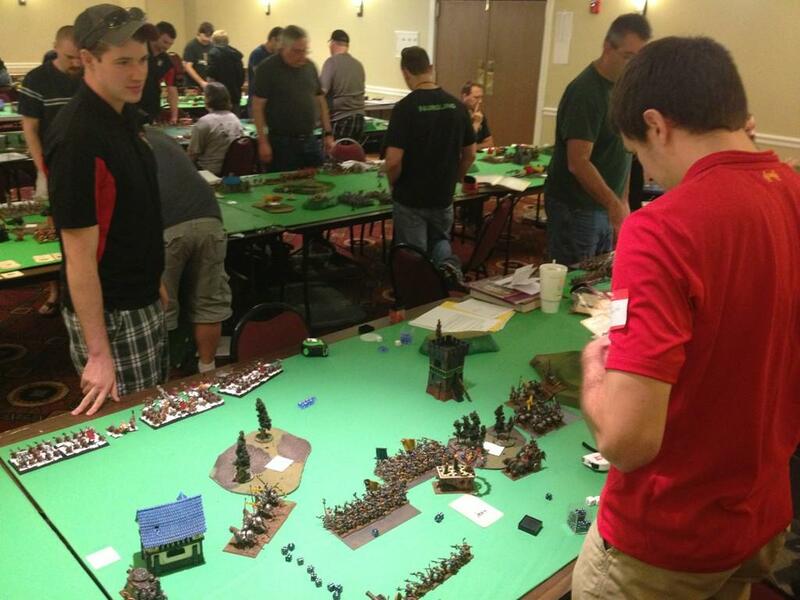 My goal is to go to four decent events a year out of state – so far I have this one and Adepticon. It was a fun weekend, and I hope that our guys do well against the Arkansas folk at the Bugeater next summer, there’s some good players down there. Posted in Warhammer and tagged CAWS, daemons, dwarfs, empire, lizardmen, ogre kingdoms, Rock Wars GT, Warhammer, Warhammer Fantasy.